On Wednesday, a pair of scraps were added to UFC Fight Night 49. 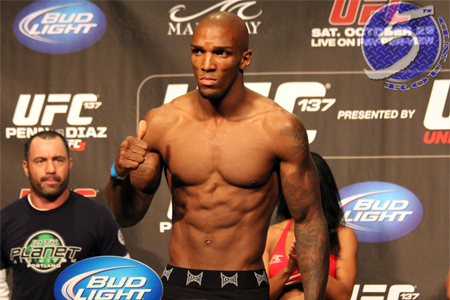 A middleweight tango between Francis Carmont (pictured) and Thales Leites, as well as a welterweight affair with Demian Maia and Mike Pyle were announced by the UFC. After rattling off 11 straight wins, Carmont tries to snap a disappointing two-fight skid. “Limitless” is looking to bounce back from decision defeats to Ronaldo “Jacare” Souza and CB Dollaway. Leites has quietly won six consecutive bouts. The Brazilian most recently TKO’d Trevor Smith in April. Maia ended his two-fight losing streak by beating Alexander Yakovlev in May. Pyle is victorious in five of his past six battles. “Quicksand” TKO’d T.J. Waldburger in February. No word if the card will be made available for live viewing via UFC Fight Pass, Fox Sports 1, Fox Sports 2 or some combination of the three.